There are things on my knitting needles again! There is a relief there in those words that might be difficult for a non-knitter to understand. With all the turmoil of moving, with all the changes going on in the past year, plus having a new puppy in the house, the desire to knit has been strong, but the actual knitting has been non-existent until now. to announce an unfinished project was located and knitting has begun. Not only has knitting begun on a scarf for myself – I have also ordered some yarn for a Christmas present to make. 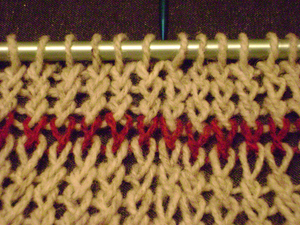 Since I am not sure if the person I am knitting for reads this blog or not, I am just going to leave it at that. Any time I am waiting on yarn to come in gives me the same sensation I used to have as a child waiting for the mail and a package. The thrill of it is still the same. Opening a package of yarn, or going to a yarn store and looking through said yarn is just like opening presents on Christmas morning! Yes, yarn is just that special to knitters. This entry was posted in 2013, beautiful, Christmas, good times, I feel, knitting and tagged Arts, Christmas, Craft, Crochet, Knitting, Knitting and Crochet, Scarf, Yarn. Bookmark the permalink. Wow! Happy knitting! And thanks for the information regarding the settling of the rattled nerves 🙂 Enjoy!